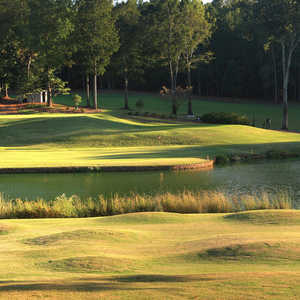 BOGART, Ga. - The Jennings Mill Country Club, like many golf courses in America, is sometimes advertised as a Scottish links-like course. No. 12 at Jennings Mill Country Club is an excellent par 3 over water. "I'm not sure what that means," says Head Professional Larry James. "It has more to do with the mounding." Well said. There isn't much Scottish links to the private course, which offers reciprocal privileges to other clubs. It has tight, tree-lined fairways with some fairly nasty pot bunkers, but there's no North Sea around and certainly no heather. It does, as James said, have mounding. A lot of it. Along the fairways and around the greens. Mounding can be good and bad, from the perspective of the wayward golfer. It can serve to keep your ball on the fairway or green, but it can also provide obstacles if you're way wayward. Getting up and down from behind the mounds around the Jennings Mill greens can be as hazardous as the various hazards on the course, in the form of water - streams, ponds, creeks and lakes - that come into play on over half the holes. The mounding also gives the layout added movement, not that it needed too much. 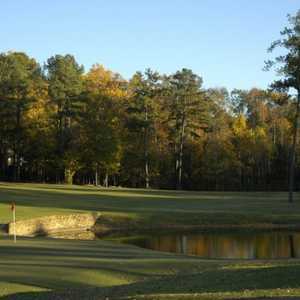 It's built over hilly terrain, which gives it natural movement, though not as much as, say, the University of Georgia Golf Course. It's an early Bob Cupp design, built in 1986, and Cupp, like many of the architects from the old school, felt that bunkers should be there for a purpose, not for decoration. As James pointed out, Cupp is known for his directional bunkering. So if you're playing the course for the first time and you're faced with a blind landing area, take a cue from the bunkers; they will point you in the right direction. Jennings Mill tops out at a tad over 7,000 yards from the back tees, and, with the narrowness of the fairways, can be a handful from back there. It's an excellent course, though the conditioning could only be described as average; there are some rough areas on the greens that could be better tended. Having said that, it is still a bargain at $49. Jennings Mill has been highly thought of for quite some time. Golf Week has ranked it among the top 25 in the state, and the Georgia State Golf Association ranked it 16th; the same association also honored its No. 13 as the best hole in the state, and it is indeed a very good hole. No. 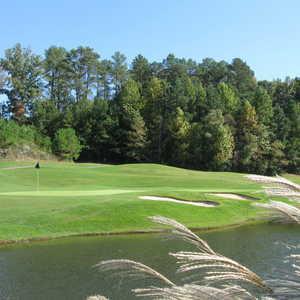 13 is a mid-length par 4 with a creek that cuts across the fairway about three-quarters of the way down. The elevated green falls off hard in front, but don't be long here - anything long will present you with a chip shot back to the cup that's nearly impossible to stop. That's only one of any number of good holes. No. 9 is the most dramatic. It's a long par 4 with a monster carry over water off the tee, if you dare. From where the pros play in the Athens Regional Foundation Classic, a Nationwide event, it's a lay-up to the right. From the gold tees, where mortals play from, it's about a 270-yard carry. Make it and it's a birdie hole. If you lay up, you have a long approach to a green that flirts with water left, which runs the length of the hole. No. 3 is a short, risky, drivable par 4, and No. 7 can be the toughest hole on the course; with the prevailing winds normally in your face, you're looking at a 180-190-yard carry over water into the green. Jennings Mill is one of those courses where you'd better have your driver under control or pay the devil. "It's not overly lengthy, but it's tight," James said. "There's out-of-bounds on every hole." The course is hosting the Nationwide tournament this year for the third straight year. The Foundry Park Inn and Spa may be a fancy boutique hotel, but they don't neglect the basics here- a cooler in your room to take to nearby Sanford Stadium, for the Georgia Bulldog football games. They also have tailgate-to-go menus. Foundry Park is the first and only boutique property in Athens, on the edge of the active Athens downtown. It was designed as a replica of row houses built in the city back in the 1920s - no heavy-footed clods stomping around over your head. There are 119 rooms and suites, and the décor is understated elegance. There is a conference room, a fitness center and an excellent spa. The inn also has the Hoyt House Restaurant. But the best part is the inn's proximity to the energetic music scene Athens is known for. In fact, all you have to do is walk a few steps from your door; the Melting Point on the grounds hosts a variety of musical acts - it's a great place to see live music, with its intimate setting and good acoustics.